Trust Hydrotech Pools as your premier pool builder to design and create the perfect pool for your home. We will help you design your pool that fits your lifestyle, your property, and your budget. We have all in-house crews for all parts of the building process of your pool, which insures construction quality and timeliness. We are highly rated with BBB and Angie’s List. We have over 30 years of experience building pools in Florida. Contact us and we will provide a complimentary consultation about your pool. We use state of the art computer modeling to design and model your pool that fits your property. We will have a visual representation of your pool that you will be happy with before we start, and your then perfect pool will be built. 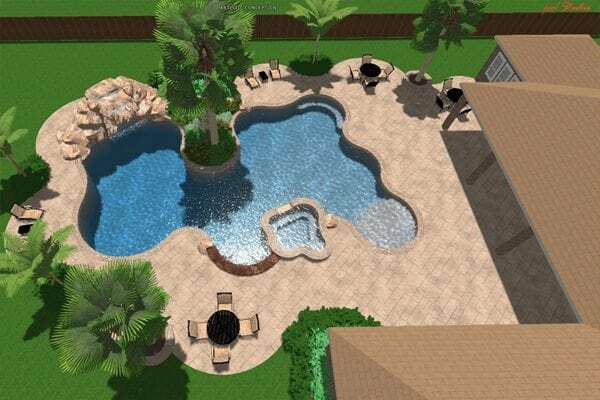 We can include any features that you are interested in, from a standard pool, to adding a spa, fountains, infinity edges, water features, LED lights, and more! Excavation – we will dig the pool, usually in one day, allowing you to see the pool taking shape. Plumbing and Electrical – the pool plumbing and electrical plumbing is run around the excavation. Forming and Steel – the steel that forms the structure shell of the pool is installed. Shotcrete – the shell is formed with a sprayable concrete called shotcrete, and sprayed along the rebar, forming the pool as well as the spa or any other included water features. Tile and pool finish – the waterline tile and the swimming pool finish is installed. The pool is nearly complete! Deck and screening/fencing – the deck and screen enclosure or pool fencing is added. final inspections and startup – inspections are performed throughout the process, and the final inspection is completed.